For example, Japan was inundated with an aggressive advertising campaign in 1974 by Kentucky Fried Chicken promoting KFC for the holidays. The company’s campaign was so successful that the fervor for KFC at Christmastime took hold and became a tradition, with KFC stores booked well in advance. Reportedly, some franchises even offer table service and adult beverages. Here in south Louisiana, New Orleans goes back to its Creole roots during the month of December – which touches on most of the rituals, customs, and contemporary trends. In addition, there are historical tours, art exhibitions, school choirs’ performances, the National World War II. Museum Teddy Bear Tea, Celebrations in the Oaks at City Park, Brunch with Santa and his Elves, and many more. However, as New Orleans is one of the most regaled cities in the world for dining, the city’s December Reveillon Dinners along with Reveillon on the Rocks cocktails are among the most anticipated and popular events of the month-long activities. Reveillon is a traditional feast celebrated during the holiday season in New Orleans dating back to the early 19th century. Derived from the French word “waking,” Reveillon menus were comprised of exceptionally lavish foods, wine, and spirits; historically served on Christmas Eve after attending midnight Mass, and New Year’s Eve after Mass. Today, Reveillon is celebrated nightly throughout December in both the Creole tradition and contemporary style in many of the city’s best restaurants. Ted Brennan’s Decatur’s seasonal menu, gleaned from the original Brennan’s family descendants, represent some of the finest, authentic Creole cuisine of any restaurant in the city. With their new location and namesake home on Decatur street recently opened, the third generation of the original founder, brother and sister Teddy Brennan and Bridget Brennan Tyrrell, have dedicated their efforts to their father, Ted Brennan. Ted, with his brothers, was the proprietor of the famous Brennan’s on Royal St. for many years; he passed away last year before the renovation of the Decatur Street eatery was completed. Teddy and Bridget have lots of support because Brennan’s executive chef and many of the front-of-the-house service staff, most having 20-30 years or more in service at the previous Brennan’s, are part of the team at Decatur. They are working side-by-side with the younger generation to assure the new Ted Brennan’s continues the tradition of creating artful Creole classics, providing excellent service, and running a groovy bar and wine program. Executive Chef Lazone Randolph, who started his career at Brennan’s just out of high school, has worked with the Brennan family more than 50 years beginning as a dishwasher. “Chef Lazone just gets better,” said Teddy Brennan. 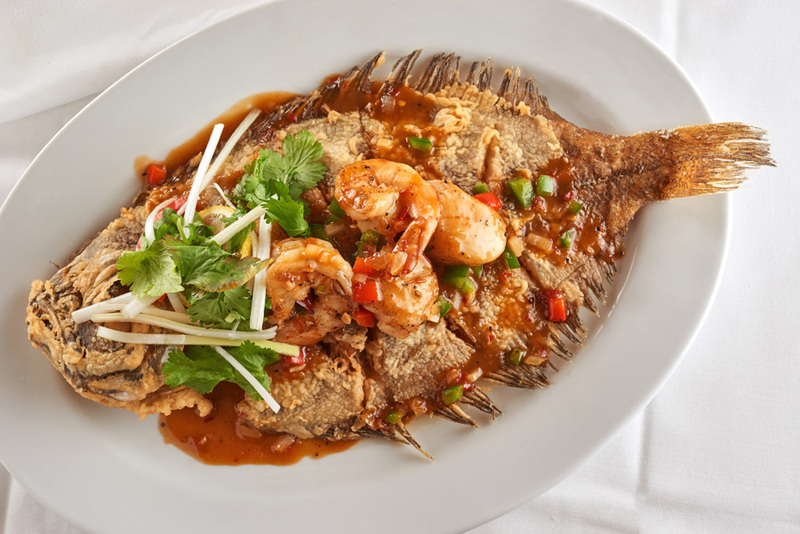 “He’s amazing.” The menu reflects the iconic dishes that Chef Lazone learned from chefs before him,; there’s the classic Creole specialties that regulars order again and again, he has developed freshened versions of old favorites, as well as adding trending flavors and textures. 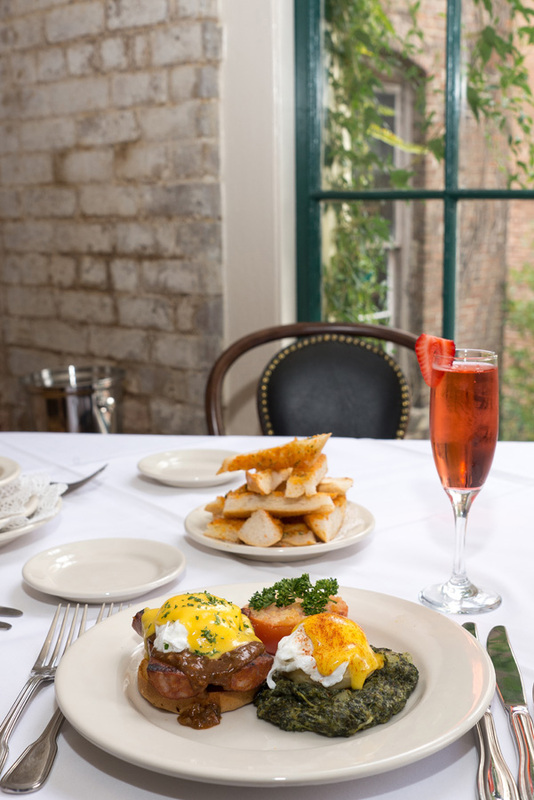 Renowned for their traditional breakfasts or brunch, Ted Brennan’s offers brunch every day of the week featuring favorites that have been served for 30 or more years such as Eggs Sardou, Eggs Hussarde, Eggs Benedict, Grillades and Grits Logan, and many others. 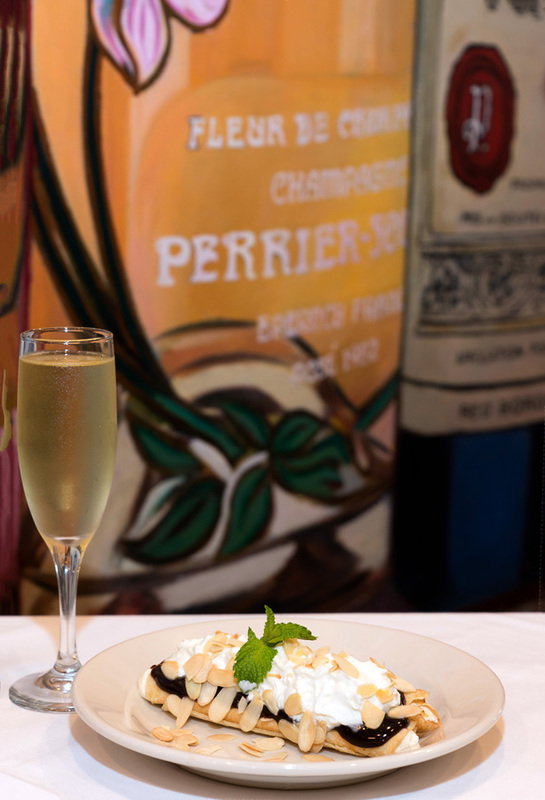 Famously traditional appetizers for both brunch and dinner are Oysters Rockefeller, Turtle Soup, Maude’s Seafood Gumbo, Barbequed Shrimp, Shrimp Remoulade, and more. Dinner choices include Trout Beaulieu, Veal Kottwitz, Redfish Wittmann, Shrimp and Andouille Rhett, Filet TMB, and other delicious offerings. And …garlic bread is complimentary! One of New Orleans’ 4 Grande Dames of Creole cuisine, Broussards is nearing the century mark in just a couple of more years. 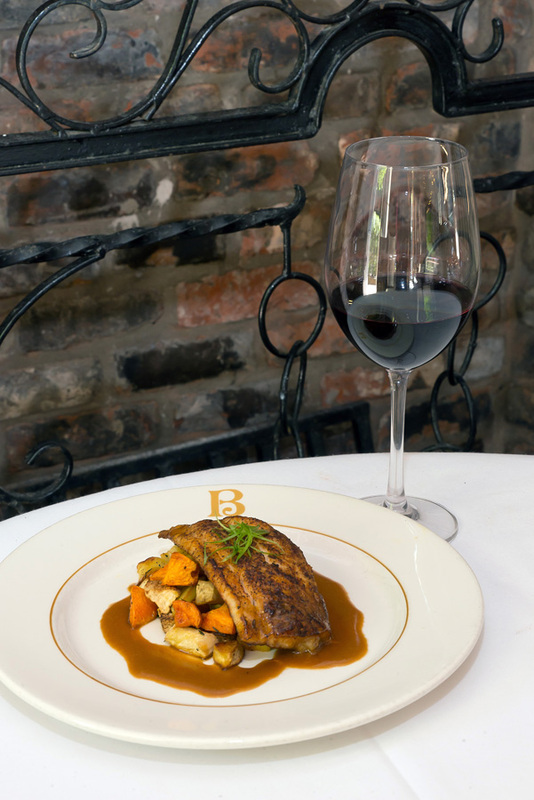 Broussards exemplifies fine dining and fun in an exquisite, historic setting…. an 1834 mansion converted to a restaurant with perhaps the largest, most charming courtyard in the Quarter. The large footprint shows off different facets of the property such as the Empire Bar, with its Napoleonic theme. On the dining side, Executive Chef Jake Shapiro heads up the cuisine, which he’s quite familiar with, having 15 years of experience in some of New Orleans most renowned kitchens. Chef Jake has created a Reveillon menu that will surely delight diners. The four-course affair begins with a choice of crispy oysters Bienville with tarragon, mushrooms and tasso, or duck confit, brandy duck liver mousse, Creole mustard and apricot glaze. Butternut squash bisque with truffle crema and crispy leeks, and a Belgian endive and arugula salad with Cambazola blue cheese, candied pecans and cranberry vinaigrette, will vie for diners favor for the second course. For the entrée, guests can choose between pan roasted Gulf fish with Creole meuniere sauce and andouille potato hash, or petit grilled filet mignon with bacon marchand de vin and celery root mashed potatoes. Dessert selections are praline bread pudding, eggnog custard and bourbon sauce, or peppermint panna cotta with dark chocolate Ganache. The price for the dinner is $48 per person plus tax and gratuity. Wine pairings for each of the dishes will be available at an extra fee. More news: Broussards’ Sunday brunch has been so successful, the restaurant has added Saturday for brunch as well. In addition, Broussards now has valet parking. Guests choose an entrée from a wide selection of main courses. The price includes a soup, salad or appetizer, entrée, and dessert. Among the 1st course offerings are turtle soup with aged sherry; shrimp, smoked duck and andouille sausage gumbo; and cream of oyster and mirliton. Second course choices, appetizers and salads, notes 8 dishes. Among those are smoked grouper with Green Goddess crème Fraiche; seafood martini Ravigote with Maine lobster, Gulf shrimp, jumbo lump crabmeat with Yukon gold potato salad; 24-hour cooked Korean boneless baby back ribs, and several others. Of the 8 entrees available, guests can choose among slow-roasted turkey roulade with giblet gravy, oyster dressing, housemade cranberry relish, bourbon pecan sweet potatoes, green beans; and paneed Gulf fish with crawfish etouffe, vegetables, and jalapeno Hollandaise sauce. 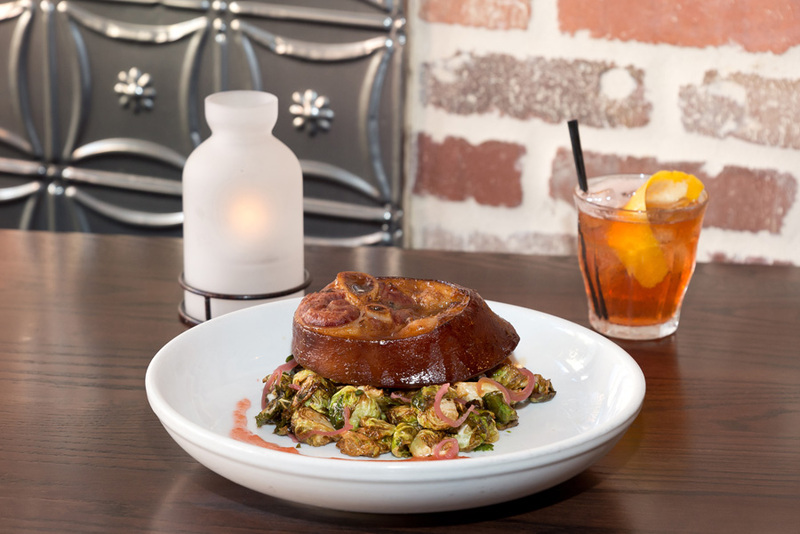 In addition, entrée choices feature a 24-hour prime pork chop, apple Chipotle sauce, collard greens, and cast iron skillet cornbread; 8 oz. filet mignon with truffle mashed potatoes, a choice of marchand de vin or béarnaise sauce, and haricots vert; rack of lamb roasted with a rosemary pesto crust, truffle mashed potatoes, haricots verts, and a port-mint demi-glace; and several more irresistible main courses. The desserts choices are just as tantalizing as the other courses. Got your reservation yet?! Just shy of two blocks away, Kingfish Kitchen and Cocktails offers a slightly more casual setting with a theme reflecting Louisiana’s populist Governor Huey P. long, a.k.a. “Kingfish,” who served as the state’s 40th governor, 1928-1932. Long loved his cocktails and Louisiana Creole and Cajun cuisine, which his namesake restaurant celebrates with great vigor. Head Bartender Matthew Gardner makes a stunning Ramos Gin Fizz – the Kingfish’s favorite cocktail as well as many other traditional and original cocktails. Gardner’s interpretation for a Reveillon on the Rocks cocktail – the contemporary, spirits side of the Reveillon-- is a Cranberry Old Fashioned, a kind of Tiki-Caribbean drink with equal amounts of Barbancourt Rhum, Beam Bourbon with allspice dram, cranberry syrup, a dash of orange juice, and angostura bitters. The cocktail, according to general Manager John Magliollo, will be available through the end of the year and perhaps, beyond. The cocktail would be a great aperitif with Kingfish’s Thanksgiving menu, or Reveillon dinner. Executive Chef Jason Klutts, a native of Morgan City, Louisiana, has put together a superb dinner for the holiday. Several salads including beets with Danish blue cheese and toasted pine nuts; a mixed green salad with candied pecans, goat cheese, red wine vinaigrette; and a Kabocha squash soup with wild mushrooms are choices for the first course. For the second course patrons can choose a traditional turkey feast with a roast turkey breast, confit turkey thigh with sourdough and mushroom stuffing, gravy, house made cranberry sauce, and roasted Brussels sprouts. The other option is smoked ham with butternut squash and tasso hash, melted onions and bell peppers, and pineapple and cherry compote. For dessert, choices are spiced pumpkin bread pudding with caramelized apples and vanilla crème Anglaise, or bourbon pecan pie with caramel drizzle and nutmeg whipped cream. The price is $38 per person, plus tax and gratuity. Kingfish’s 4-course $45 Reveillon dinner is just as exciting, beginning with roast duck and andouille gumbo. Go to www.kingfishneworleans.com to view the full menu.